We use ConvertKit for our email marketing and proudly recommend them as a marketing partner. Remember when email newsletters were the latest, greatest thing in online marketing? Remember when you could add a form to your sidebar that simply said, “Sign up to receive my newsletter” and people would join your list in droves? Unfortunately, those days are over. In today’s overcrowded online market, getting email subscribers is a lot more complicated than it used to be. Most people are rabidly protective of their email inboxes, and we’re understandably hesitant to sign up for yet another newsletter we’re not going to have time to read. What people do want, though, is good content. They want helpful, useful, and entertaining articles, podcast episodes, and videos that will make their lives easier and solve their problems. As a content marketer, what does that mean for you? If you’re considering offering a newsletter, should you shelve the idea? If you’ve been sending out a newsletter for years, should you stop? First, you need to figure out the most efficient (and most subscriber-friendly) way to publish content and send it out to your email list. As you already know, sending regular emails to your list is the best way to build relationships with your subscribers. You’ll also get more traffic, comments, and social shares from the folks on your email list than from any other source — so it’s absolutely worth your time to figure out the best way to stay in touch with them. Let’s look at the pros and cons of two popular email types for content marketers: email newsletters and content notifications. A traditional newsletter is usually sent on a regular schedule (often weekly or monthly) and typically includes a branded HTML header, an opening greeting, and a main article. Not all newsletters look exactly like that, but many do. A newsletter might also include links to the publisher’s content (or curated content from other sites), badges, coupons, featured photos, or special offers. Picture a newsletter as a collection of items, instead of one stand-alone piece of content. Warren and Betsy Talbot of Married with Luggage send a newsletter out every Sunday morning. It’s called “Notes from the Marriage with Luggage Life Lab,” and it includes a collection of personal stories, links, and photos from their life abroad. Every other Saturday, Rainmaker Digital’s own Pamela Wilson sends a beautifully formatted newsletter from her business, Big Brand System. Her newsletter, The Weekend Digest, includes a collection of attractive images, links to Pamela’s blog, and other relevant content handpicked by Pamela and her team. If you advertise your newsletter will be published on a particular schedule (for example, every Monday), your reader will expect your email on that day. Presumably, you will be more motivated to get your email out the door if you know your audience is waiting with bated breath. If you’ve trained your audience to know they will get an email from you every Monday morning, they’ll usually recognize your newsletter when it hits their inboxes. A newsletter format provides flexible content sharing options, so you’ll have more room for links to posts in your own archive, curated links, or other content. Sharing content like this on a regular basis can help you earn a reputation as a generous and thoughtful authority in your field. Since you’re a smart content marketer, I know you’re already using a qualified email service provider; you’ll want to publish your newsletter with that email service provider as well. But unfortunately, no matter which email service you use, formatting a newsletter — especially one that includes a variety of images and links — can be time-consuming. Even the most user-friendly service will still require some fine-tuning to position your articles and images in the right places so your newsletter shows up well on multiple devices. Having an established newsletter-publishing schedule could either be motivating or horrifying, depending on your capacity for procrastination and your overall stress level. Make sure you can commit to your schedule before you set expectations for your audience. Unfortunately, these “Read Later” folders can be deadly for your email message. If your recipient reads your newsletter at all, it might be months after you send it. You can also send an email broadcast to your list any time you publish a new piece of content (including blog posts, podcast episodes, or videos). Neil Patel publishes a new blog post every day and sends a “teaser” notification email to his list each time he publishes something new. He usually includes three separate links to his latest post in every email. Michael Hyatt typically publishes the full text of his posts in his notification emails. He regularly includes a question at the end of his email, so his subscribers can converse with him on social media about the message’s topic. (c) 2013, Michael Hyatt. Used by permission. Originally published at michaelhyatt.com. With individual notification emails, your goal is to get your subscriber to consume your newest piece of content. You can focus all your energy (and potentially all your links) on achieving that goal. Because of this singular focus, you may get more traffic (and more readers) from this approach. Your readers are also potentially less likely to stash your email in a “Read Later” folder if they know they only need to click one link and consume one piece of content. Quick notification emails — especially if they are simple or text-only — might be less burdensome to create. You can potentially craft and send a broadcast notification email in minutes. If you don’t publish content on a consistent schedule, you’ll end up sending emails to your list on an irregular basis, too. Because of that, you might see a higher unsubscribe rate when you do send a broadcast, because your subscribers aren’t used to hearing from you and may forget they signed up for your list. If you do publish frequently, your list will receive a lot of emails from you. Long-term, this isn’t necessarily a bad thing, but you may hear some whining from your subscribers if you transition from emailing your list once a month to emailing several times a week. If you decide to send notification emails, should you include the whole post in your emails or use a teaser excerpt and a link? If you send an excerpt and a link, you can train your subscribers to click on the links in your emails regularly and expect good things when they click on those links. On the other hand, you may get more people to read your post if you put the whole post in the email. Both methods can work — you can test each of them and see how your audience responds. Your job now is deciding whether email newsletters or notification emails are a better fit for your audience. If you send a newsletter, you’ll be committed to a set publishing schedule. Readers will expect emails from you, and you’ll probably see less people unsubscribe from your list. If you decide to send notification emails, your emails will be focused on a singular goal — getting people to consume your content. You might get more visitors to your site, video views, or podcast episode downloads. 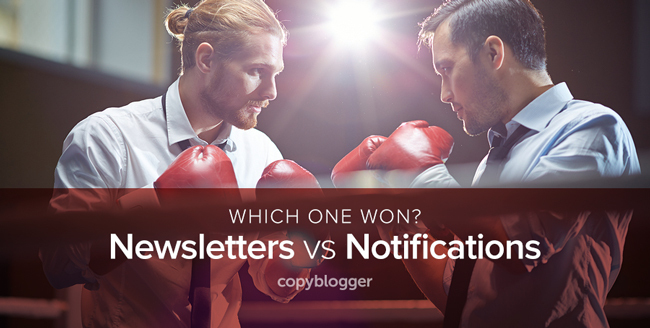 Notification emails are also faster to create and send than newsletters. The good news is, you don’t have to choose between the two. There’s no reason you can’t incorporate both into your email marketing strategy. For example, Pamela Wilson sends her regular email newsletter (The Weekend Digest, see above) as well as short, excerpt-style notification emails when she publishes new posts on her blog. No matter which way you decide to go — newsletters, post notifications, or a combination of both — the most important thing is communicating with your audience on a regular basis and reliably sending them great content. Consistent, high-value communication with your list is critical to building a trusted relationship with your prospects and customers. If you master that, your subscribers will not only learn to trust you and your content — they’ll also start to love getting emails from you. And what could be better than that? Don’t miss any upcoming posts on Copyblogger! Register for your free My.Copyblogger account to access our proven marketing training library. Plus, get fresh, free articles and audio content from Copyblogger and Rainmaker FM.